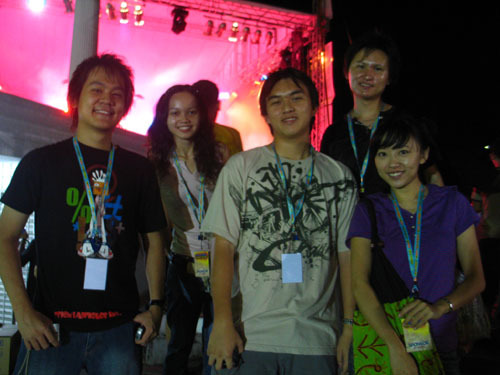 As an East Malaysian Advertlet blogger, I received the email inviting 5 bloggers in Kuching to cover the DiGi Fu-yoh! event at the Amphitheatre on 9th June, Saturday night. After some consideration, I decided to give it a miss. I figured I’ll most likely be there to cover it for the entertainment column anyway and didn’t have to deprive someone else of a pass. Three of the five Kuching bloggers who scored a pass are bloggers I’ve met before – Ben, Irene and Jimmy. The two I’ve neither heard of or stumbled across before are Adrian and Alysha. In case Advertlet or anyone else is wondering how they fared, they behaved like responsible rookie reporters – armed with a pass that will let them go ANYWHERE, yet not taking full advantage of it. Not necessarily a bad thing though. I’m sure they got the photos/videos they needed while trying to cause as little inconvenience as possible. Anyway, since I know exactly who they are and why they’re there, I decided to document their assignment. Enjoy. Adrian mock-slides down the half-pipe while his comrades immortalise the moment. Irene and Alysha shows how to shoot without being in anyone’s way. 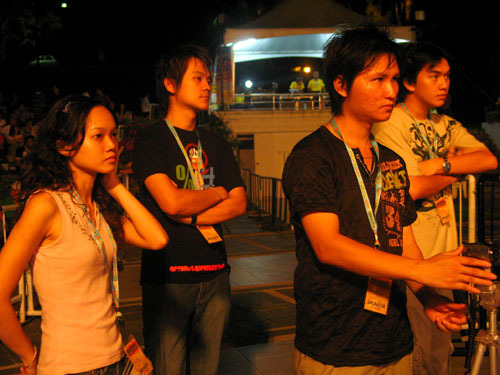 Irene, Ben, Jimmy and Adrian paying close attention to the action on stage. My “almost, but no cookie” photo. Oh Irene, why do you hide from me? Adrian gets his turn with Jason Lo. The group at the end of the night. Hope you guys enjoyed that taste of event coverage. I think Advertlet did right by teaming with a major advertiser like DiGi, who can offer this kind of opportunity to bloggers in East Malaysia. If there’s one thing that annoys us, it’s the fact that everything happens in KL. It’s good to know that one company is looking a bit further (ahead). So if you’re on this side of the country and haven’t checked out Advertlet yet, you should so you’ll get a shot of making your blog cough up some form of reward for your all your hard work on it. Maybe there’s another event to cover… but next time, you might have to fight me for it. 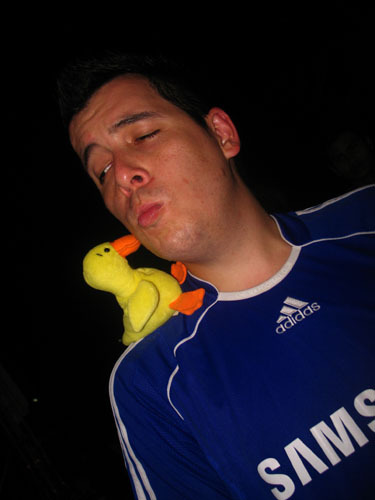 Ducky wants you all to know that he adores Lo. Irene: That’s my “close but no cookie” spelling. At least I got the URL right? Adrian: I was a little surprised that there was nobody to look after you guys. Hehehe, URL correct :P Yeap, Eric just told us to call him when we need him LOL… He said we can go anywhere with it. Wanted to go backstage but too busy in front taking photos and see performance. 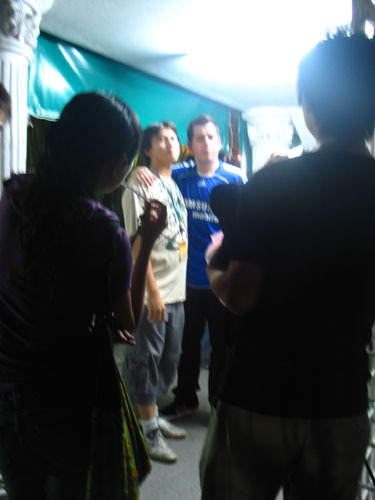 We went backstage 2 times, the first time we went, many of the artistes were outside so we did take some photos with them. The second time, we were told that we were not allow to go in the room :P LOL… So have to wait outside. oops, did i manage to comment in ur blog? another uber cool event in kuching happening while I am away…. garrhhhh…. why cant they wait till I am back? why why?